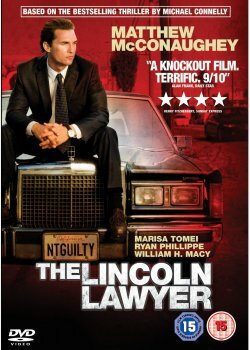 A 4 Star Courtroom drama that doesn't take a back seat. The main story hangs on the case of Luis Roulet (Ryan Philhipe, Flags of the Fathers) a young man accused of assault with a weapon on a young prostitute. Haller thinks that this wealthy young man's family is the meal ticket for his usual destitute clients. The court room drama centres on Haller making the case against the prostitute in that she was using his wealth against him, (her ticket out of her life of vice). Its his clients insistence that he is totally innocent that finally raises some suspicions and he has his investigator Frank Levin (William H. Macy, Fargo) look into his clients activities and that of his worst nightmare, sending an innocent man to prison. This is where the film really takes off and I will not spoil the rest as there is many a twist and turn which have been well hidden until revealed. (nice). Overall Mr McConaughey holds this all together with his ex-wife (Marisa Tomie, The Wrestler) as a convincing counter point. The courtroom phases are well researched as the writer is Michael Connely. The prosecutor Ted Minton, (Josh Lucas, The Poseidon, 06) doesn't know what has hit him once Haller gets his teeth into the case. The only thing that spoils it for me is Phillipe's plastic face as it never seems to crease or wrinkle throughout his performance. All in all a really good film, even better for a second watch. Out Now on DVD and Blu-ray Cert 15.